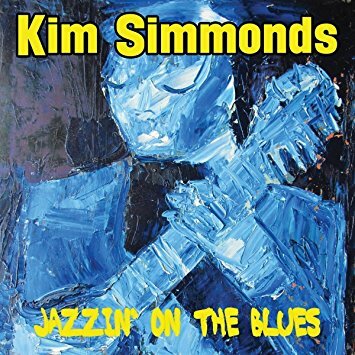 I just had the opportunity to review the most recent release, Jazzin' On The Blues, from Kim Simmonds, and it's quite good. Simmonds, well known front man for Savoy Brown, takes an occasional break from his band and does individual projects and this is a fine instrumental one. Opening with Dancing On A Memory, a smooth instrumental ballad, Simmonds accompanies himself on rhythm guitar as he plays fluid lead melody. Lightly salted blues riffs make this a grand opener. Theme For Deborah has a Latin percussion line thanks to Ron Keck and Simmonds dances across the strings. Very nice. Surrender is one of my favorites on the release with a soulful guitar melody, accompanied by acoustic rhythm guitar. Excellent! Title track, Jazzin' On The Blues, finds Simmonds rapid firing jazz riffs over a solid melody, capped by his own blues harp work. Another of my favorites is The Maze with it's Bo Diddley beat, tight guitar riffs and glistening chords. Another track with a Latin flavor, Nightliner, has strong jazz overtones. Simmonds really feels the rhythm on this one presenting a tight melodic number. T Bone Walker influenced, True Blue, is a beautiful blues number with lush lead lines complimented by his own harp work over solid bass and light rhythm guitar. Excellent! Wrapping the release is Facination, a fine ballad with a pure melody and simple rhythm backing. Simmonds has released a number of fine solo works and this one is among the best.